On Thursday I finally got around to making my first dedicated-to-the-nymphing-cause trip of the summer. As I was walking down to my first spot, an angler upstream — presumably trying to be helpful — shouted out, “There are no fish in there. They’re all gone.” Well, one of us is going to be wrong, I thought to myself. One hour and three trout later, I was pleased that it wasn’t me. I fished a new nymph setup that day, a drop-shot rig. 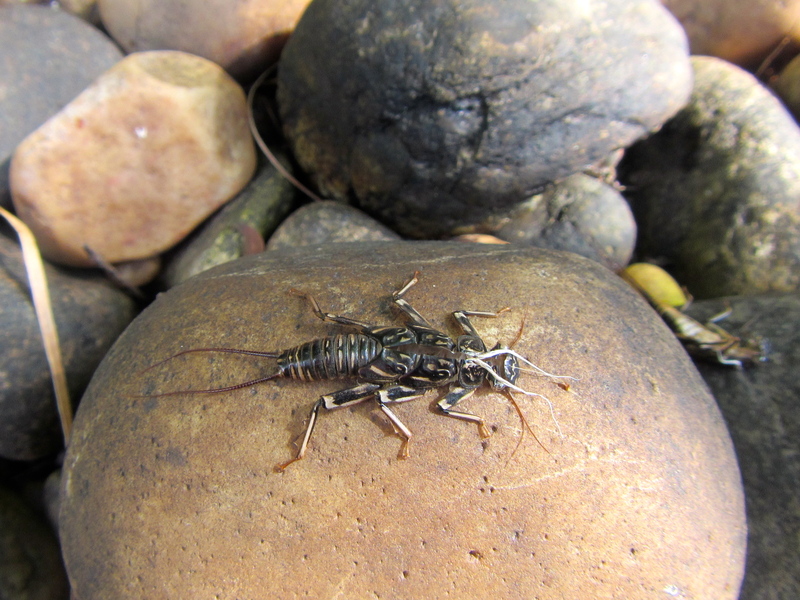 My version was a leader about 8 feet long, then an emerger-like nymph dropper on a tag of 4# Maxima, then 16″ of 5# Rio nylon, another nymph, then a 6″ tag of the 5# with 2 BB shot at the bottom. The shot tag is tied off the bottom nymph hook eye. (If I get enough interest, I will draw and post a diagram.) The point of the rig is to get the weight on the bottom where it should be, then suspend the flies at different heights just off the bottom. You can fish it neat or with an indicator. I went the indicator route. Obviously, you already know it worked. I did, however, drop three fish in the course of the day, and I wondered if that bottom fly is harder for a fish to grab since it isn’t swinging freely. More research is required. Lucky me! This rainbow has been in the river for a while. Well-defined pink lateral band, intact scale pattern, perfect fins. Off to the second spot, where I landed a rotund wild brown (all the browns I took today were never wards of the state). Met up with friend Todd, and we each managed fish a ways downstream. By now, though, it was 11:00am and the bite had slowed. Away we went to Spot D, where we met up with Peter Jenkins of Saltwater Edge fame. Todd showed off by catching all the trout. Mr. High Hook Spot D in action. I dropped one more fish at Spot E before I had to make tracks toward responsibilities. The two flies I fished were a size 16 soft-hackled Pheasant Tail on the top dropper and a BH Squirrel and Ginger on bottom. The fish showed no preference, split right down the middle on the two. On Saturday, I was able to fish for two hours between games at my son’s soccer tournament. 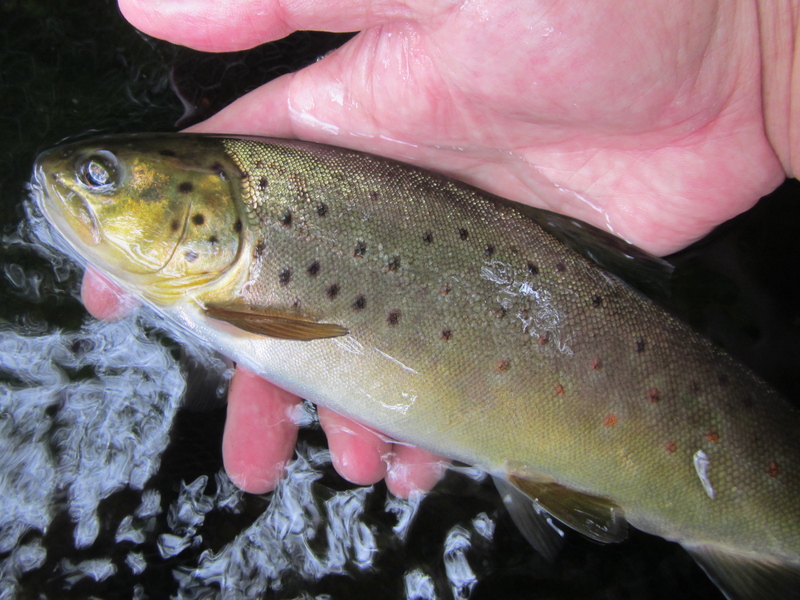 Wet fly was the method, and while I found plenty of fish willing to jump on, they were all juvenile Atlantic salmon. Still, a lovely interlude on the water. 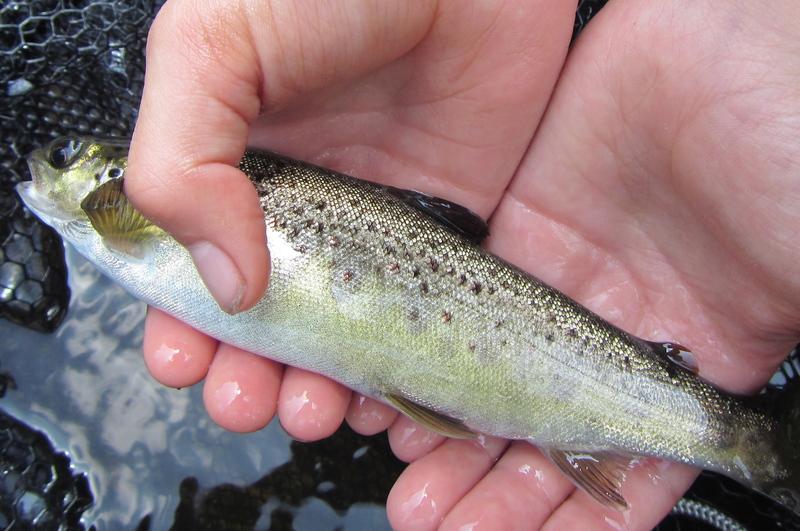 Reminder: Starting Monday, September 1, the lower TMA becomes catch-and-release. 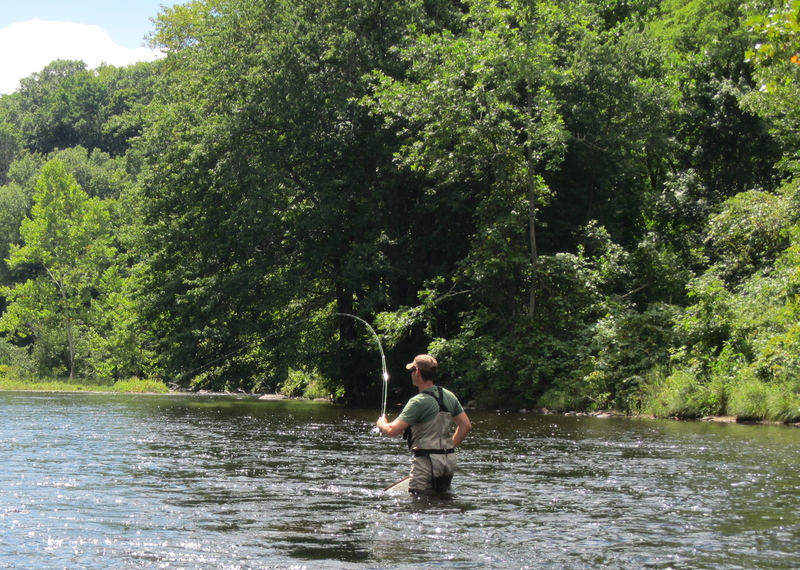 And so it came to pass that the Culton men went forth on a crisp, sunny August afternoon and swung wet flies on the Farmington River. Okay. So Gordon was fishing a soft-hackled streamer, and was using a spinning rod. The point is — well, if you’ve ever taken your kids, or any kids fishing, you already know. Watch out for those trees on the backcast. 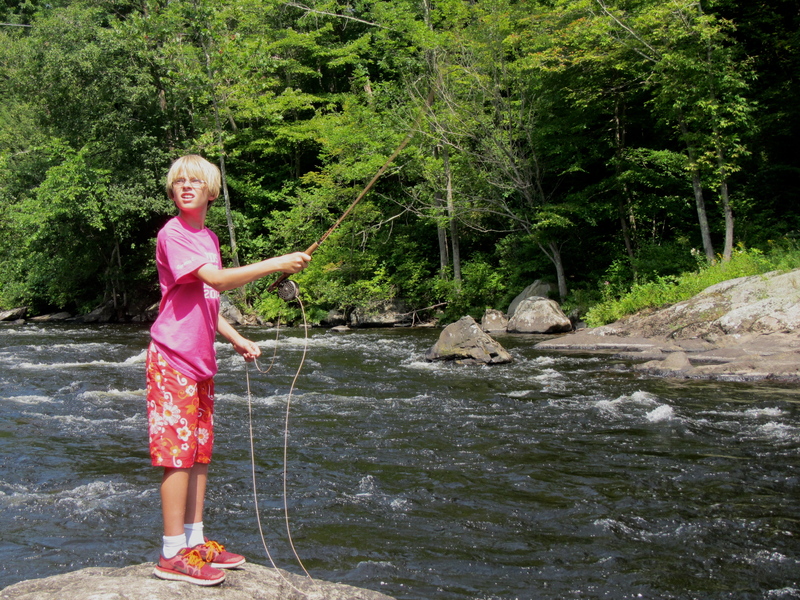 Cam didn’t catch anything, but he did a more than capable job casting and presenting his soft-hackles. Another place and time and he could have been well into some trout. A fly addict is born. Gordo’s juvenile Atlantic salmon. Dad hooked it on a hackled March Brown spider, Gordon landed it with the ten-and-a-half-foot rod. “Can I hold it?” he wanted to know. You betcha. Just get your hands wet, and watch out. They like to jump. 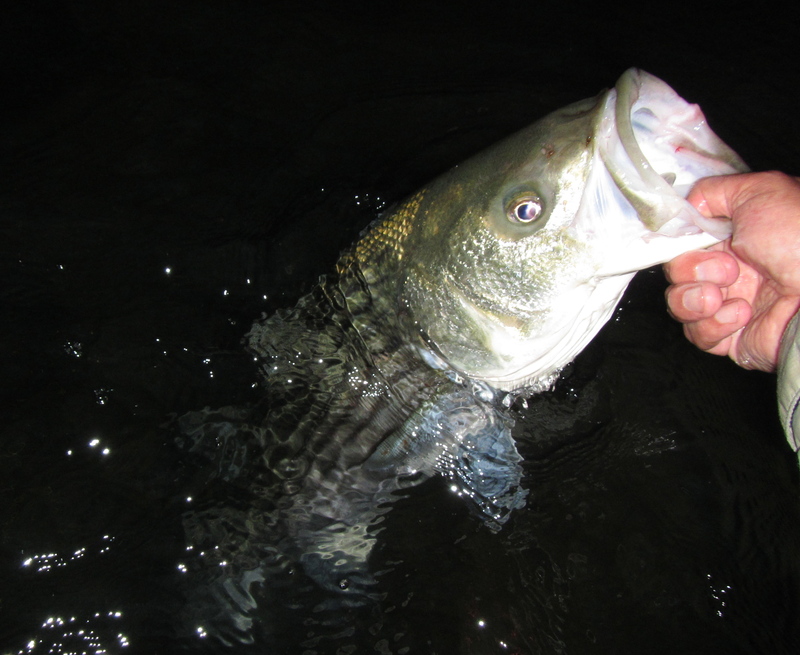 Please take a moment to read up on the proposed management plans for striped bass in 2015 and beyond. There is only one public hearing on this in Connecticut, which will be August 26 in Old Lyme. * What level of harvest reduction should be made? * Should the reduction in harvest take place over 1, 2, or 3 years? * Should bag limits and minimum size change, and should a slot be imposed? Specific options under consideration are in the proposal. I suspect that supporting one of them is much more effective than proposing your own solution, but that’s just me. Public comment is being accepted in writing or in person at the hearings. To me, the most important thing here is that fishery managers are FINALLY acknowledging that the species is not healthy and that action should be taken. Let’s encourage them to be responsible and protect the health of the species. Thanks to Charlie for the alert. Grass-roots activism, baby. Grass-roots activism. If you can’t attend, make your voice heard and send Mike Waine your thoughts at mwaine@asmfc.org. How can you refuse a beautiful face like that? That striped bass are a sport fishing species in trouble is not new information. We’ve already been to the edge in our lifetime. What’s most troubling about the situation is that there is no uniform policy in place to protect these fish — and the bait stocks they feed on — from big government all the way down to grass-roots anglers. There is confusion at the grass-roots level as well — yesterday on Mike Francesa’s show on WFAN, one of his guests waxed nostalgic about what a great job the authorities have done to boost striper stocks. Really? You’re kidding, right? Sadly, he wasn’t. A Block Island keeper lives to fight another day. Every year, tens of thousands of her sisters aren’t so lucky. I must have a great face for radio. Why else would John Kovach be gracious enough to invite me back on his Yankee Fisherman show on HAN Radio? 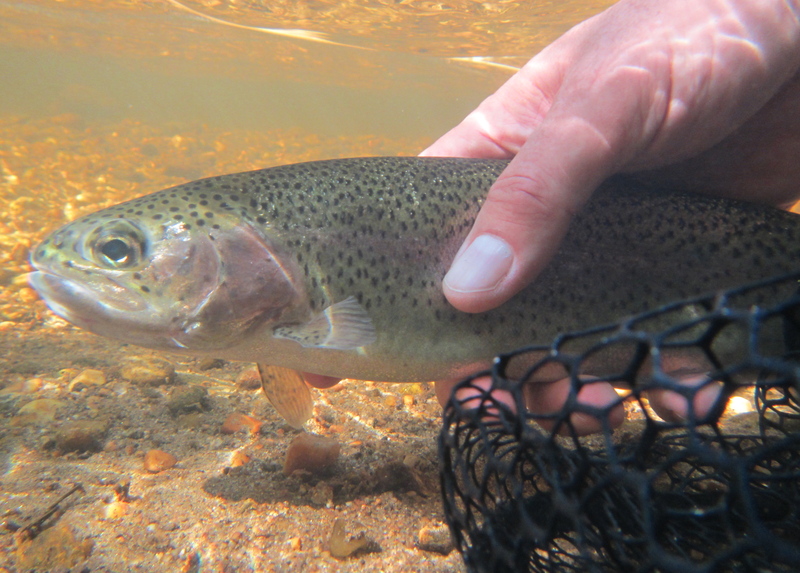 We covered lots of topics: this summer on the Farmington, the effects flows have on fishing, fishing wets as dries, long leaders, setting the hook, and just what the Dog Days really means. 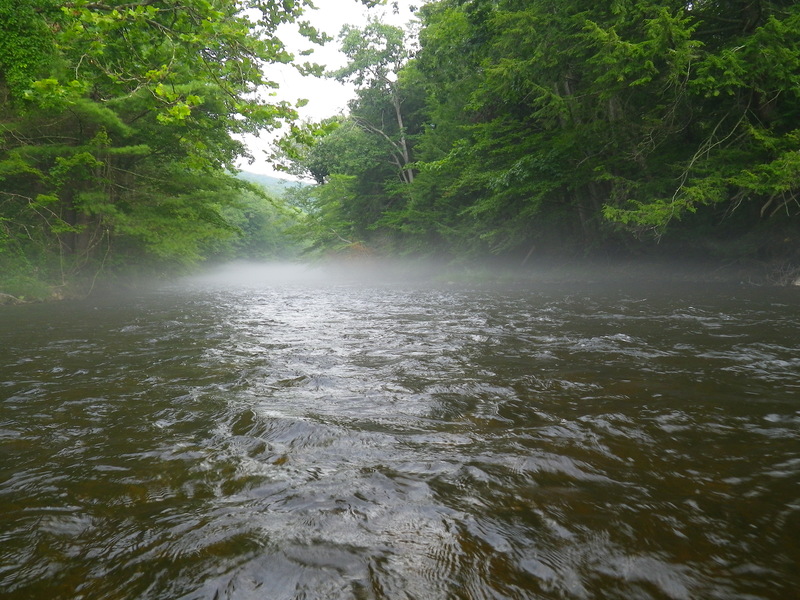 A grey, mysterious summer morning on the Farmington. Who knows what possibilities the day will bring?